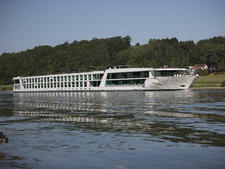 The 182-passenger Emerald Dawn is one of Emerald Waterways signature "Star Ships." 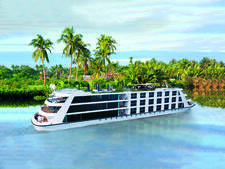 Emerald Waterways is the value-oriented sister brand of Australian-owned Scenic, and Emerald Dawn boasts the same bright, contemporary decor of its siblings. Expect extensive use of glass, modern art and cool design details such as giant plant holders in the lounge, ornaments made from natural materials and a sleek black and chrome bar that wouldn't look out of place on dry land. The standout feature is the heated swimming pool with a retractable roof and 180-degree view at the aft of the ship, which is transformed into a cinema at night -- complete with fresh popcorn and cocktails. 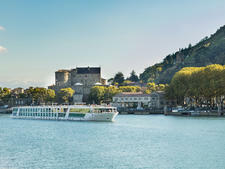 The area was a new-to-river feature when it was unveiled on Emerald's first ship and the line continues to develop it, adding aqua aerobics in 2019. Emerald Dawn's 92 cabins are situated on three decks and divided into five different categories -- two singles (130 square feet), 18 staterooms (162 square feet), 60 Panorama Balcony Suites (180 square feet), eight Grand Balcony Suites (210 square feet) and four Owner's Suites (315 square feet). The Owner's Suites have a separate bedroom and lounge area, large bathroom, roomy walk-in closet and an outdoor balcony with a table and two chairs. Other perks include a Nespresso coffee machine, use of an iPad, daily canapes, four items of free laundry per day and a complimentary mini-bar restocked with wine, beer and soft drinks, or customized to passengers' preferences. The Grand Balcony cabins comprise one room with a balcony. In both categories, the balconies have floor-to-ceiling windows that drop down halfway at the touch of a button. The balcony area can be shut off from the rest of the cabin with folding glass doors, or these can be left open to create more space in the cabin. The Panorama Balcony Suites have similar drop-down windows that create an "indoor balcony," but do not have the sliding doors. All of the suite category cabins are situated on the middle and upper decks. 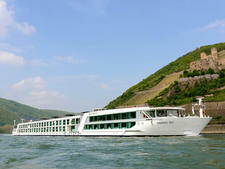 The staterooms and single cabins are all located on the lower deck and have fixed windows set high up on the walls. Standard amenities in all cabins include a TV entertainment system -- which has a soothing virtual fireplace -- an umbrella, shoe cleaner and shoe horn, robes and two sets of earplugs, which is a thoughtful touch for light sleepers. Also useful is the "do not disturb" switch, which illuminates a red light outside the cabin door and saves hanging a sign on the door handle. Meals are served in the main dining room, Reflections Restaurant, which serves breakfast and lunchtime buffets and an a la carte evening meal, all on a freestyle dining basis. An extensive choice is offered at all meals, and Brits and Aussies will be pleased to know that Emerald Dawn stocks their respective favorite breakfast spreads -- Marmite and Vegemite -- which can be a rarity on other ships. A novel feature at the lunchtime buffet is a DIY sandwich station -- ideal for passengers who want a snack rather than a full meal. Similarly, in addition to the dinner menu there are "always available" main courses of steak, chicken or salmon. The Horizon Lounge, on the upper deck, is used for a self-serve early-bird breakfast and light lunch option. 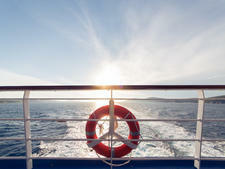 On sunny days passengers can sit out on The Terrace, a sheltered open-air area at the front of the ship. 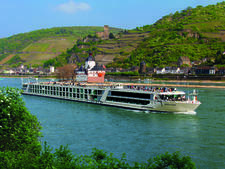 Cruisers can also take food to eat upstairs on the sun deck, where an alfresco barbecue lunch is served at least once a week, weather permitting. Emerald Dawn has a small gym, hair salon and massage room, and there is a walking track and putting green on the sun deck. In 2019, Active Managers will help passengers take advantage of fitness classes and active excursions so people can keep fit while they travel. 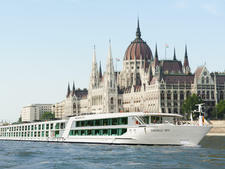 The ship sails on itineraries on the Danube, Rhine and Main rivers. 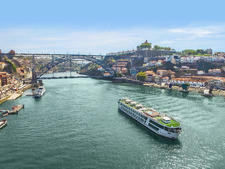 The 182-passenger Emerald Star is affordable, comfortable and friendly with simple, yet modern decor and pricing that includes excursions in every port.